Within days of the Monday Elementary Sports Day, I ran into two twentysomething Japanese guys as the Cirlce-K convenience store near my apartment. I recognized one of them from a festival I’d stumbled upon in the summer, and he recognized me as well. Around 8:00 p.m. one evening in July, I’d been coming home from the grocery store when I found a large group of people standing by the side of the road, some holding rod-mounted rectangular paper lanterns, and others holding water guns. Some of my kids ran up to greet me, and I noticed that most of the girls were wearing kimono. When they invited me to join their crop-blessing festival, I told them to wait just a minute. I sprinted home and grabbed the water cannon I’d bought when I went Astroturf-tobogganing with Bishop and Socks, and happily joined my kids and neighbours as they walked around, chanted, and sprayed water at one another. So when the guys in the convenience store asked me to come out for the taiko (Japanese drum) festival in November, I told them I was in. Practice was every night at 8:30. I still had iaido on Tuesdays and Thursdays, as well as Japanese lessons on weekends. Added to the list I now had taiko practice for a little over an hour every available day, since I had to learn how to play twelve different pieces on the ōdaiko (big taiko drum) for November 2nd and 3rd. But that was fine. Everything was manageable. I just agreed volunteered to create Halloween at Thursday Elementary. I’m such an IDIOT. I would have time for only one more journal entry in the ensuing week. I’d decided at Thursday Elementary that I should start doing Halloween lessons as of next week, and since it seemed easiest to explain using a picture book, I determined that I’d illustrate one. But then I thought, what was the point of merely telling my students, “Hey, look, kids in North America make costumes and get candy”? The only way to do it right would be for the kids to experience Halloween for themselves. I’m the kind of person for whom it isn’t enough to simply dig my own grave: I have to start by cutting down a tree and carving out a shovel to dig with. Put the grade ones, twos and threes together in the school meeting hall for two consecutive periods. Explain the idea of Halloween to them using the picture book, and then have them create masks that they can wear. If we could get the principal, vice-principal and nurse to help out, the kids would have at least six “houses” from which to receive candy, and they could go trick-or-treating inside the school. I’d intended to have the kids create their own masks using a paper template I’d thrown together on the computer, but the grade one teacher said they probably wouldn’t have time to do that, even in two hours. 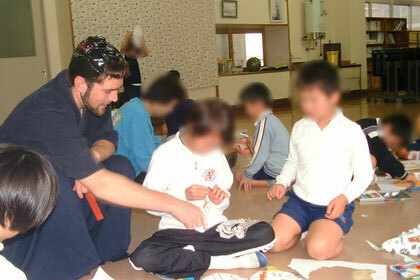 He recommended that I instead create a set of masks from which the kids could choose. With a defeated whimper, I reluctantly added “create dozen masks” to the massive itinerary I’d suddenly decided to drop on my own shoulders. This all had to be done by the time I returned next Thursday. Apparently, most Japanese people keep only money in their wallets. They always have the important stuff and an emergency cash stock elsewhere. They should really explain that to you right when you get off the plane to prevent potential apoplectic tirades. I started drawing The Halloween Book the instant I got back from Thistle and Dixie’s joint birthday party in Mishima on Sunday afternoon. I’d bought a big sketchbook and watercolour paints on Saturday, and I went to bed at 2:00 a.m. Sunday with about ten pages sketched and my alarm set to wake me up to continue work at 6:30 the next morning. I was seriously beginning to wonder if I’d have time to finish this thing. And given my new role as the Crusader of Halloween, I now had to spend at least an hour after school every day explaining to all my other teachers exactly what Halloween was, what kids did, what adults did, what I needed everyone to do, and get approval for a two-period lesson while convincing the nurses and administration to help out. 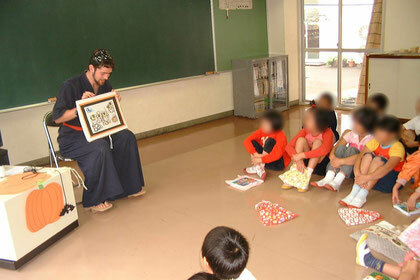 The idea of wearing a costume nonplussed most of the teachers; it’s not something Japanese people usually do. I started inking a bit on Monday night, running out to the Circle-K to get traceable copies so I could speed up the remaining pencil work. Bedtime was 2:00 a.m. yet again. I finished the masks on Tuesday and continued inking my book at the junior high. Everyone who walked by seemed quite proud to tell me I was very good at drawing, but I was just quietly furstrated that they were impressed by mere skill when it was the volume of time being poured into this thing that was really impressive. The book was turning out to be twenty big pages of hand-illustrated art that I was starting to get very defensive about. I made several copies of the whole thing at Circle-K that night so I wouldn’t put the originals at risk when I started painting—even if the copy paper did bubble with the watercolour. I slept at 2:00 a.m. again. I got really edgy on Wednesday. The vice principal forgot to pick me up for the second week in a row, so I lost thirty valuable minutes and got to school at 8:00 with a full roster of prep-heavy lessons starting at 8:30. I had to make photocopies, cut strips of paper, set up pylons, and find and clean a tire of all things—and then I had to talk to all the teachers about this insane Halloween thing I wanted them all to do in a week’s time. The lunch lady was convinced I had a fever because my face was going all red and puffy while I waited for the teachers to finish their lessons at the end of the day. They ended up getting a very curt ten-minute explanation before I burst out of the building and ran down the mountain to catch my bus. I was seriously wondering if I was going to get this thing done at all, and I still had to buy supplies and make sure everything was ready to go at Thursday Elementary. I made copies of the fully-coloured, eighteen-page Halloween Book at midnight Wednesday night and got to sleep at 1:00. Thursday morning, it rained. Rather than endanger my child of four days’ labour on my bike, I hopped on a bus packed with high school kids on their way to P. Rock. As soon as I got to school, I started cutting out big orange jack o’lanterns for the teachers to place outside their rooms. We needed elastics, staplers, tape, a TV and VCR, and I still hadn’t pasted the Halloween Book together. I wanted to mount it all on orange and black paper, but I wasn’t sure if I’d have time. The teachers seemed pretty satisfied with their preparations, but I could only think that they had no right to be: they’d only brought costumes and candy; I’d just created Halloween in seven days and I wasn’t even finished yet. I was, um, going a little crazy. The preparations for Halloween had been honestly killing me. I would later describe my state as “three-quarters mad.” But even when I told them, none of the teachers quite seemed to understand. They’d just say, “Oh, it must be difficult,” and continue on with whatever it was they were doing. I’d had the teachers all bring mask samples to their kids at the beginning of the day so I’d know how many of each to make for the third period, and one of the other teachers copied them onto thick paper for me because I simply didn’t have the time. I’d bought a bunch of ¥100 plastic bats and spiders, and I found a nicely-sized metal desk in the school meeting hall to put them on. The instant I shifted the desk, a real spider jumped out from underneath it—and it was almost the size of the rubber one in my hand. I leapt across the room. Then, before the spider ran away, I grabbed one of the teachers from the office to show him the ridiculous irony of what had just happened. I put on my new blunt katana, the geta (wooden stilt shoes) I’d received from Gaijin Kabuki in Shizuoka, my old Korean sword-fighting uniform, and a cheap plastic hair bob and headed to the school hall as a samurai. I had the little metal desk covered with spooky knickknacks and jack-o-lanterns, the TV ready with a Japanese dub of The Nightmare Before Christmas, a chair to sit in, and ¥4000 ($50) of candy hidden in the corner as the kids came in. As soon as the grade ones arrived, they started trying to pull and tug at my katana to the point where I was tempted to pull it out and use it on them. I’ll admit I wasn’t entirely displeased when I turned and accidentally bonked one of them as he tried to tug on it for the umpteenth time. He got the message. And from that point on, it achieved a level of perfection beyond anything I could possibly have foreseen. I warned the kids that the first five minutes of the video were REALLY SCARY and they all just said, “Bring it on!” and naturally weren’t scared a bit. After getting everyone out the door with two pieces of candy each, I had a chance to run around to see the spectacular costumes the teachers had come up with. When the kids came back, I had exactly fifteen minutes left, which was just enough time to show the next part of the video. The “Christmas Town” sequence finished precisely as the last seconds of class ticked down. It was unbelievable. When it was over, I wanted to hug every teacher involved. I’d only taught for two of the six periods in the day, but it was probably the fullest day I’d ever worked. Then I had to do it again. And again. And again. It gradually got down to routine, though the sheer number of students at Friday Elementary made it a constant challenge. In my first instalment with the lower grades, I wanted to have one class after another come into the same room and make masks in a preparatory period the first week, and then go trick-or-treating the next week just to keep things manageable. But I was teaching right from the first period to the fourth, and I had only ten minutes between classes and no time to make the masks in advance. What had been a raving success on Thursday became an absolute disaster on Friday. The grade ones took forever to do anything, and were still cleaning up ten minutes into recess. Then the grade threes all showed up ten minutes early and started playing with everything and getting in the way before the grade ones were even finished. I most decidedly did not have time for the blank stares that greeted me in response. When I finally got a volunteer, I didn’t have a lot of patience for my own language inadequacies as I explained very quickly what I needed done. All I wanted to hear was “okay” and the sound of immediate photocopying, and the “umm…” I kept getting back was clearly the wrong answer. I’d added the third line to try to soften things a bit, but it came out just as hard as the previous two and she hustled quickly away. The coordinator of the English program had a few words for me at the end of the day. In short, he couldn’t see the point of all this mask-making, and it seemed to be too difficult for the students anyway—though I think he meant that it had been too difficult for the teachers. I’d come into school thinking I could pull it all off as a one-man show, and when I found very quickly that I was in way over my head I’d started making immediate, exacting demands of everyone around me. I was starting to think I’d worked myself to the ground all week just to bring about pain and suffering. After school that day, I went to Monday Elementary to explain everything down to the last detail to make sure I could avoid causing the same pandemonium a second time. Then I came back to Friday Elementary and spent an hour hammering out the details of how we could make this all work properly with the grade fours, fives and sixes next week. Nothing ever approached the perfection I’d achieved that first time out at Thursday Elementary, but after my dose of humility that Friday, things went a lot more smoothly. The next week at Friday Elementary, I had a full team working on the Halloween effort, just as I should have done in the first place. I actually didn’t feel any sense of satisfaction until I showed the book to Thistle and Dixie when they randomly drove down from Numazu that Sunday. And after that, I was finally able to take it easy. I think I’d just been waiting for a superlative. I almost look like a real teacher. Well, except for the silly outfit.